If you want to read about the funny antics of cute possums (which was intended to be the main point of this blog), I would suggest skipping over this post, where I talk about one of their biggest enemies. Last night, in addition to Grendel who is still sleeping in box 4, I saw two more carpet pythons on the roof, so this is probably a good time to write a post about these animals. 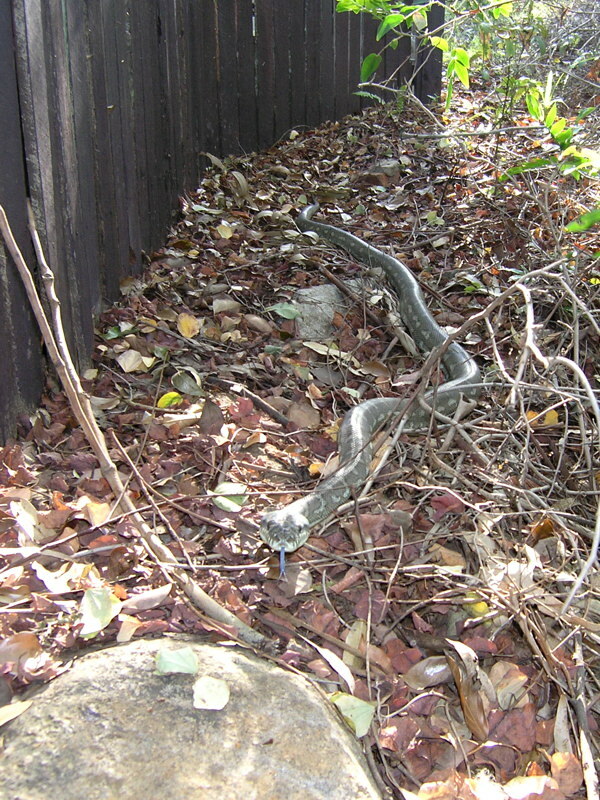 Carpet pythons are common along the eastern coast of Australia and are particularly common here in Brisbane. If you're interested, the subspecies we have here is Morelia spilota mcdowelli. They grow to 3.5 m (about 12 feet) in length. Here's one that was in my back yard a few years back. They mainly eat warm-blooded prey; small mammals and birds. They are a major predator of possums. 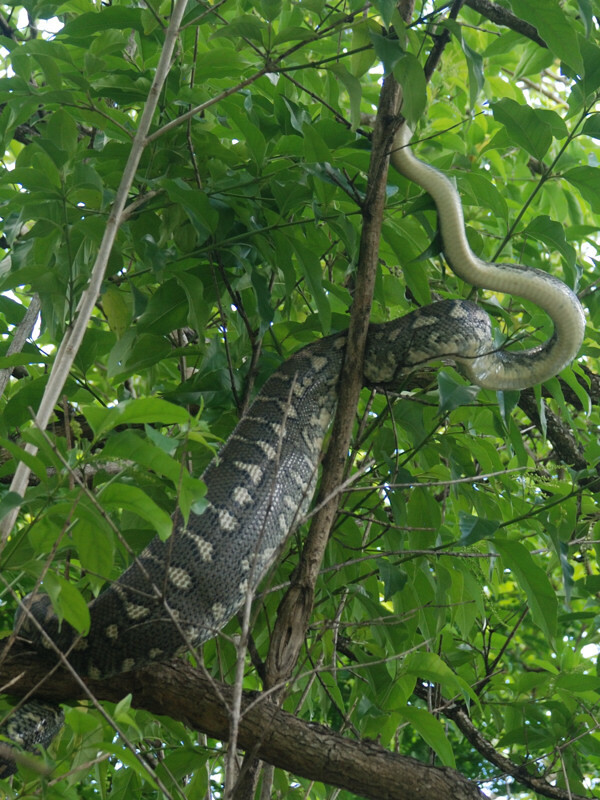 In January of this year, a python with a bulge in its belly was seen in the tree where we usually feed possums. This was the python I subsequently named Grendel. Grendel climbed onto the roof and tried to get in under the eaves, but couldn't fit, and made hir [I still don't know Grendel's gender] way into possum box 4, and curled up to sleep. Kiki was aware of Grendel right from the start. When Grendel was climbing along the edge of the roof, she went onto the balcony rail underneath and stared up at the snake intently. It was clear from her actions that she had identified it as a threat. She later went into a tree overlooking the roof and started making loud puffing sounds while glaring at the python. Normally, puffing sounds are though of as a territorial thing, however it might be that they convey more information than we are aware of. It seemed to me that she was advertising the presence of an enemy. For the next week, Grendel hung out in box 4, leaving only occasionally for a stretch. S/he then disappeared from view for a while, but was probably still lurking in the area. Grendel may have tried to get at Gumdrop (a ringtail) and her baby on the 21st Jan, because they were seen to leave their box around 1 pm, and spent the rest of the day high up in a tree on the other side of the house. This is unusual for possums; not only are they nocturnal (and therefore sleep during the day) but also they tend to get mobbed by birds when caught out in the daylight. On Feb 15th, Grendel caught Gumdrop and Lychee in box 2. The attack was recorded by the box camera. At least one, but probably both of the possums were strangled and eaten. Unfortunately, even after multiple viewings of the film (and it wasn't an easy thing to watch), I can't be 100% sure what happened. One possum was caught and strangled as it tried to get out of the box, but the body of this possum ended up underneath the camera, blocking the view into rest of the box, so it wasn't clear whether the other possum managed to escape. It also didn't help that the box camera was a cheap one which had been in use for over 6 years and was overdue for replacement. This was a very upsetting experience. Gumdrop was a cheerful and friendly little possum who we had known for years. When she had babies, she would often go out of her way to show them to us. After this big meal, Grendel hung around in boxes 2 and 4 for another week before disappearing. We'd hoped Grendel had gone away to persecute someone else's possums, however on 18th April s/he appeared back in box 4 - looking comparatively thin, which is not a good sign. Kiki was aware of Grendel immediately. That night I saw her on a branch right next to box 4, glaring at it intently. I suppose she could smell the python inside. Kiki appeared to be scent-marking around the box. The day Grendel returned, Flea suddenly disappeared. I wasn't worried that she had been eaten, because none of the pythons had had a possum-sized meal in a considerable time. Anyway, Flea showed up again tonight for the first since she left, acting a lot more cautiously than usual. It's not clear whether she has been chased away by Kiki, or whether she knows about the pythons and is deliberately keeping out of the way. Wasabi (Gumdrop's other baby) has also not been around. 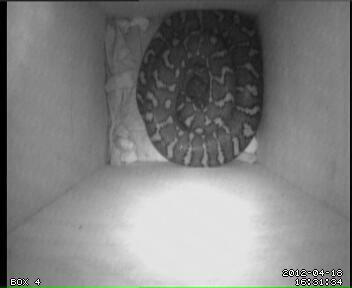 Last night, another carpet python was seen outside of Grendel's box. 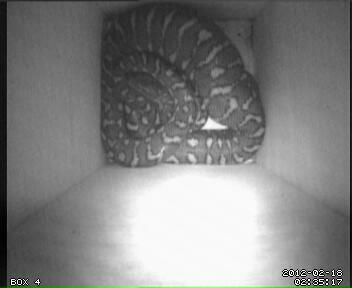 This python appears to have entered the box to say hello to Grendel at some stage, but this was not picked up by the camera. 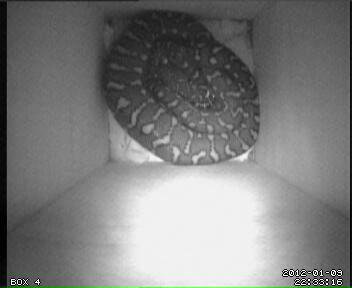 I managed to get a photo of this second python on the roof later. 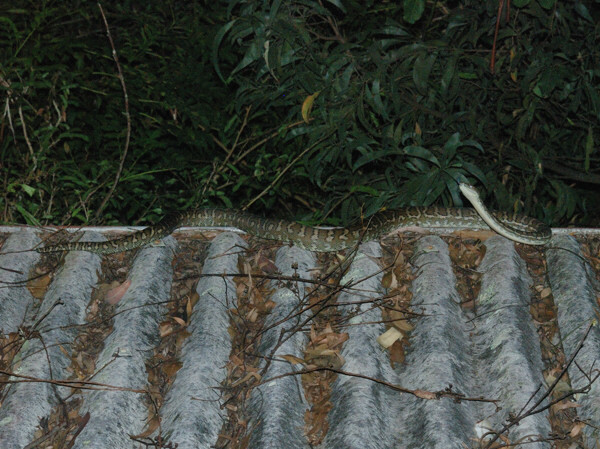 It's difficult to estimate the length of a snake, but here we have a guide; the roofing is "Super Six", which has corrugations which are 6 inches from one crest to the next. This would make this snake at least 1.5 m (5 feet) long. 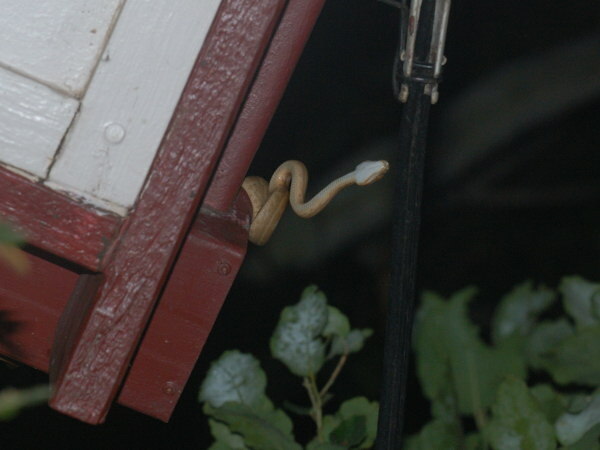 While photographing this snake, I also saw a baby carpet python on the gutter. It's difficult to tell from the photo, but this a very small snake. As a guide, the black cable near the snake's head is my cable Internet cable and is about 1/2 inch in diameter. 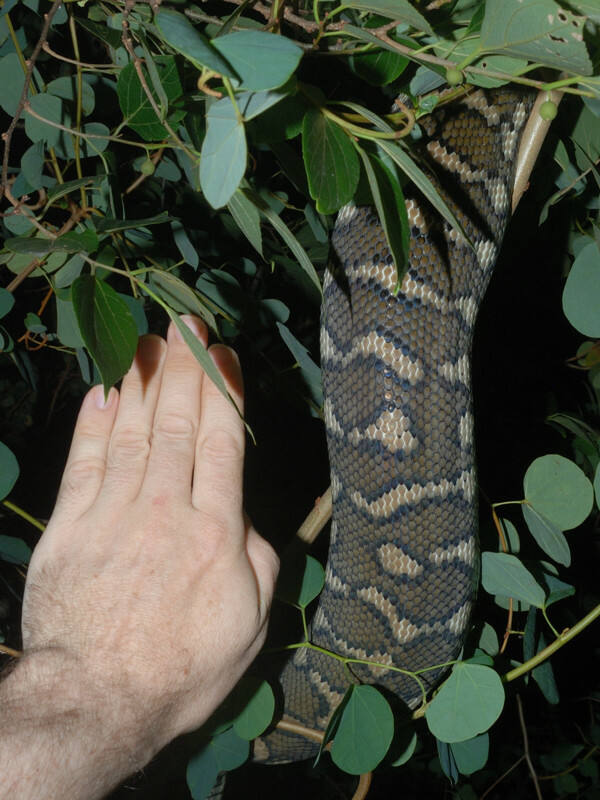 I suppose time will tell whether all of these pythons are going to be a problem for our resident possums. It's a bit of a dilemma. I want to look after the possums and keep them as safe as I can. I can't help being horrified by the deaths of Gumdrop and Lychee, and I would feel much better if the pythons decided to move away. On the other hand, carpet pythons are deserving of at least as much consideration as possums; and arguably even more, since they are somewhat less common, and probably more in danger of being killed out of hand by ignorant people. Nevertheless, I admit that if I could somehow python-proof the possum boxes, I would do it, even though this could be considered to be unfairly taking sides. Then again, this is a bit of a moot point since there doesn't seem to be any way of actually doing this.